As we draw nearer to the release that we've all been waiting for, the new toy reveals are beginning to increase in frequency from a slight trickle to a downpour. Check out what was revealed at the Toys R Us in Time Square today after the jump. 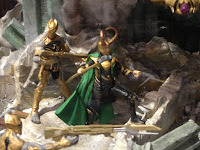 Photos are flooding the net from a few different sources today of a new Hasbro Avengers diorama that was set up overnight in the Time Square Toys R Us location. 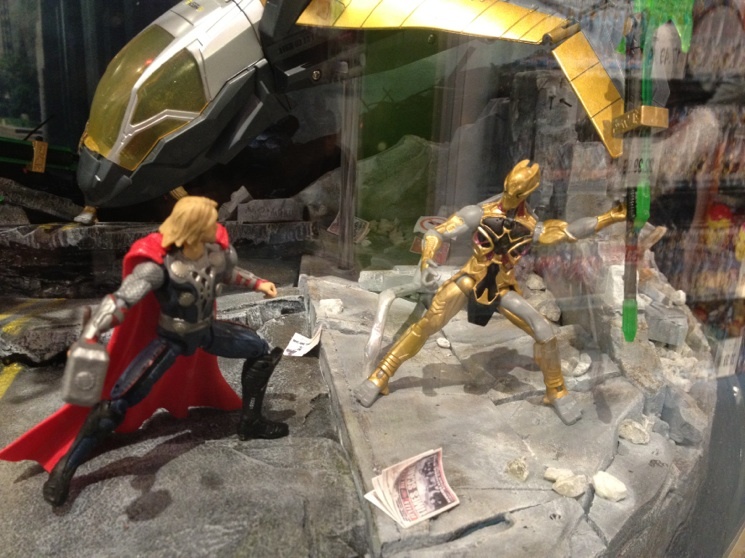 Aside from being a pretty badass diorama in its own right, this display is notable because it gives us our first look at several new figures from Hasbro's The Avengers line. First up are the mysterious aliens/enemies from another realm. Rumors from a well known and respected source a couple weeks ago indicated that we may be seeing THREE different figures based on these characters; a soldier, a leader, and a "chariot driver", that we can reasonably assume is a deluxe figure including a small flying vehicle. Well, I see a couple different alien baddies in this diorama, and quite a few flying chariots, so it looks like the rumor has some truth to it. Still no official word on the actual identity of these guys, though. Everyone thought they were Skrulls at first, but Marvel Studios has vehemently denied this. Time will tell, but my money is on these guys being the Chitauri, which were basically the Ultimate universe version of the Skrulls. If I were a betting man, I'd expect the official identity to be revealed within the week... perhaps even within the next twenty four hours. No word yet on which wave these guys will be in, but rumor has it they will be in Wave 3 with Widow and Hawkeye, which has not yet gone up for pre-order. Also in the case and shown for the first time anywhere, a new Nick Fury figure, rumored from NY Toy Fair to be coming in Wave 4. This figure appears to be different from the Fury available in a TRU boxset in the Iron Man 2 line. That figure re-used a G.I. Joe body. This version appears to be all new, or at the very least, not re-used Joe parts. 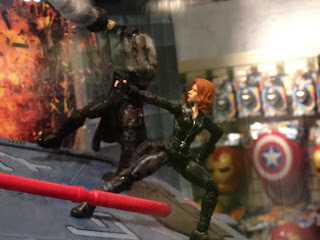 The highly anticipated Black Widow figure also makes another appearance alongside Fury, and still appears to be the most articulated figure in the line. 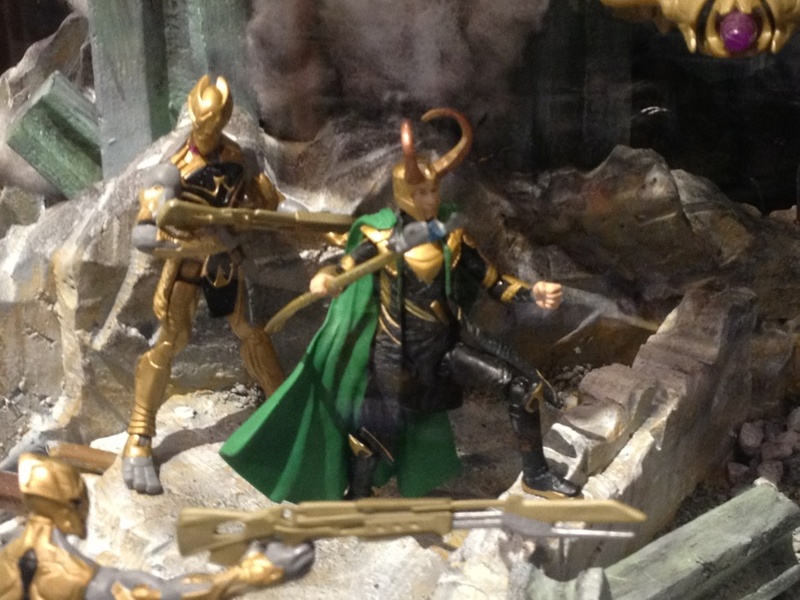 The only movie character apparently missing from the diorama is Hawkeye. 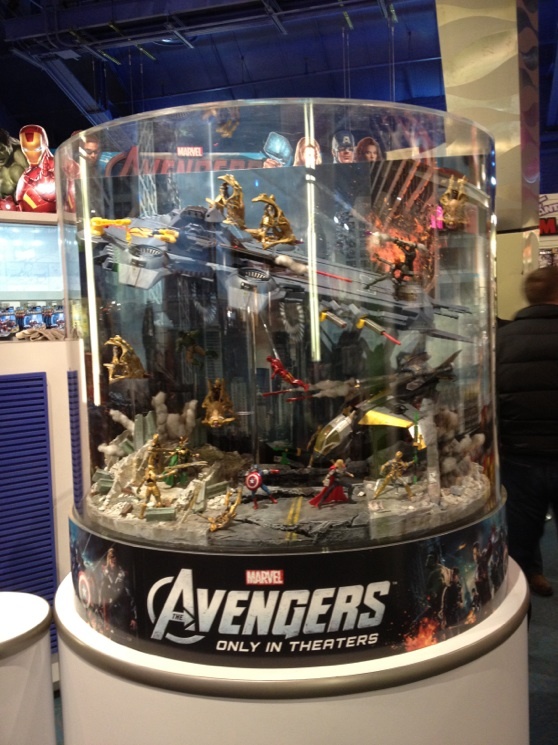 Finally, while it's not a reveal, we once again get a look at the massive Helicarrier. No word yet on when this will hit retail, but I for one am looking forward to it. Check out more photos at ActionFigureInsider. Hasbro is much more tight-lipped these days when it comes to any sort of firm plans with the Marvel properties (so much for fan relations, eh? ), but I find it odd that we haven't seen or heard about any retailer exclusives for this line yet (unless you count the leaked comic series box sets made up of Marvel Universe figures rumored to be coming to Walmart). My local Target just redecorated the action figure aisle in an Avengers theme today, complete with big green footprints on the floor, so you KNOW Target is going to have some sort of exclusive for The Avengers. 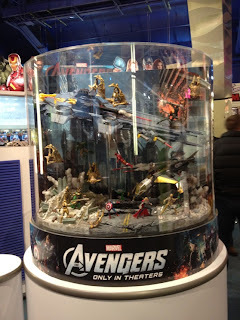 We'll probably see something sneak out like the comic packs and Fire & Ice set in the Captain America line last year. Hopefully it won't just be slightly repainted figures like those sets were, though. With the movie now less than four weeks away, we're bound to be seeing even more new reveals, pre-orders, and hopefully sooner rather than later, new sightings at retail for all the Marvel lines.